classic beef rib cap rillette, originally uploaded by aarn! +18th October, 2011+. seared 5-lbs beef cap/blade trim in a hot dutch oven containing 2T. olive oil. pulled the browned beef from the pan and set aside. added 1 ½ c. diced yellow onion, 2 ribs diced celery, 4 berries of all-spice, 2 cloves, 5 sprigs thyme, 1t. korean chili powder, 1/2t. old bay, 2 bay leaves, salt and pepper to the hot pan. cooked until the onions were transparent, then added 1 1/2c. white wine and 2T. tomato sauce, and reduced. mixed about 26oz. of beef stock into the ingredients in the dutch oven, then placed the beef into the liquid, covered and let simmer for 3.5-hrs. let rest in the braising liquid over night. reheated the liquid and beef in a 300-degree oven until warm. strained and separated the fat from the the braising juice, and set aside, discarding all of the aromatics and herbs. pulled the beef into strands. whipped the beef strands in a stand mixer using a paddle, along with 1/2oz. gin, 9 dashes of fee brothers orange bitters, 3/4c. of the separated beef fat, 3/4c. of braising liquid, 5 cloves of olive oil poached garlic paste, 7 sprigs of chopped thyme, 1/2t. cayenne pepper, 1oz. apple cider vinegar, and salt and pepper to taste (over-seasoning slightly). pressed the fluffy and emulsified whipped rillette into bread pans, using a soft spatula to push out the air bubbles, then capped with some of the remaining beef fat. refrigerated for a week or two, then sliced and seared in a non-stick pan (probably the only reason to keep a pan like this around). 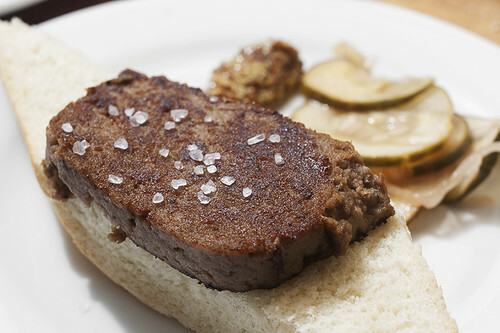 served with slices of a fresh baguette, some whole-grain mustard, and homemade pickles. also, made some mean egg sandwiches with the seared rillette, cheddar, pickles, tomato, and mayonnaise. Great info, thanks for posting. If you are looking for a tailgate bbq then you really shouldn’t look any further. This thang rocks!